1. Put the cream into a saucepan and place over a medium heat. In the meantime, chop the chocolate into small chunks and place in a bowl. 2. When the cream has reached boiling point, pour a third of it over the chocolate and whisk thoroughly until smooth. Add each remaining third of cream, whisking well each time, until completely smooth. 3. Add the butter and whisk to incorporate. 4.Pour the mixture into a container and place in the fridge until fully set. 5. To make the salted caramel, place the sugar in a saucepan with 12g water, and heat until it reaches 150°C. 6. Add the whipping cream in three stages and whisk, being careful with the steam that is being released. 7. Once the cream has been incorporated, add the butter and salt and whisk thoroughly. 8. When the mixture reaches 115°C, pour into a small tray lined with greaseproof paper, so the caramel is approximately 5mm deep, and allow to cool until set. When cold, cut into 0.5cm cubes. 9.To make the coating, place the shortbread on a tray lined with parchment paper, and place in an oven preheated to 180°C, gas mark 4, for 10 minutes or until golden brown. 10. Remove from the oven and allow to cool completely. Place the shortbread in a food processor and pulse until it becomes a fine powder. 11. When you’re ready to assemble the truffles, scoop out balls of the chocolate ganache mixture using a melon baller. If the mixture is a little hard, allow to soften at room temperature for 15-20 minutes. Place the truffles on a tray lined with baking parchment, and chill for 15 minutes. 12. Using the handle of a teaspoon,, make a hole in the chocolate truffle. Add the caramel cube. Quickly roll the chocolate spheres between your hands. Place back in the fridge for 15 minutes. 13. Remove the truffles from the fridge and roll in the shortbread powder. Finish with a small piece of gold leaf. 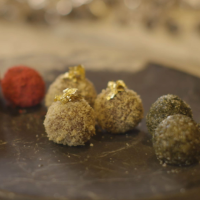 Click here to see Heston's mulled wine truffles recipe.